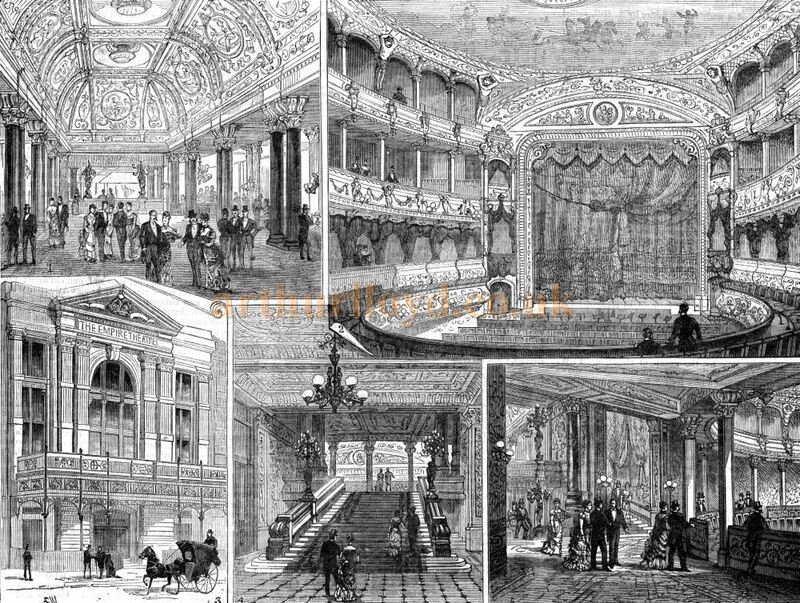 Above - Sketches of the Empire Theatre, Leicester Square - From the Illustrated London News, April 1884 - Courtesy Alfred Mason. Top left, the Foyer, Top right, the Auditorium, Bottom left, the Exterior, Bottom middle, the Entrance Staircase, Bottom right, the Promenade. The accompanying text to this series of sketches reads:- 'This new theatre which was opened last week with Herve's opera-buffa of "Chilperic", is built upon the site of Saville House, on the north side of Leicester Square, where a succession of various popular exhibitions and entertainments took place for many years preceeding the fire in 1865. Our illustrations present a view of the exterior, and several parts of the interior, which was originally planned by Mr T Verity the architect, but was altered according to a change of scheme by Messrs. J and AE Ball, the contractors for the whole being Messrs. Bywater. The space from the proscenium to the back of the pit is 83ft, the width between the walls is 80ft, and from the floor of the stalls to the ceiling 51ft. The green room at the back of the stage can be used for spectacles if required. The proscenium arch is 35ft high and 32 ft wide. Over and above the seating allowance of room in the theatre there is unusual space unoccupied. This has the advantage of facilitating exit and extending the means for emptying in case of necessity. The decorations are of crimson and gold, with pictorial designs in several parts. The ceiling of the auditorium bears an allegorical design and is circular, with a cornice and arcade bordering, supported by caryatides. The entrance hall and vestibule are grand and imposing, while the effect of the scagliola pillars with gilded capitals which support the roof is good. The grand tier, or dress circle with four rows of seats is on the same level with the vestibule. The private boxes are behind these seats, and the width they occupy is kept on the floor above for a promenade communicating with the open foyer, whence a clear view of the stage is obtained with comfort. Mirrors reaching from the floor to the ceiling of the foyer have a novel effect, and appear to extend the space as well as to increase the light by reflection. The above text in quotes, and its accompanying illustration, were first published in the Illustrated London News, April 1884, and were kindly sent in by Alfred Mason.